Not in one of our markets or prefer to meet online? You can engage with Applerouth services no matter where you live. We have worked with students in more than 20 countries and throughout the United States. Our user-friendly technology brings one-on-one tutoring, group classes, seminars, and proctored practice exams to the comfort of your home. Online Applerouth students receive paper copies and online access to all of our materials. 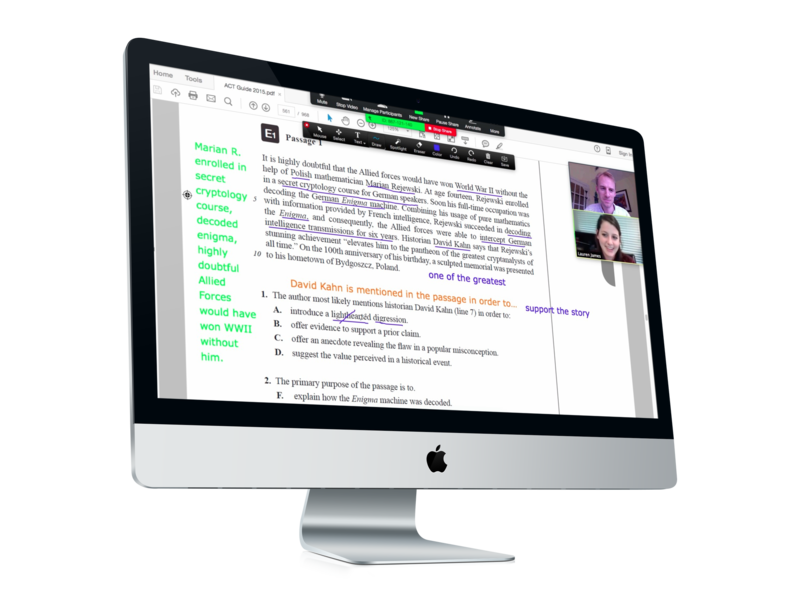 State of the art collaboration tools, including a shared whiteboard and annotation features, facilitate a uniquely interactive and dynamic tutoring experience. As an online student, you have access to the same elite tutors as in-person students. In fact, your tutor options are unlimited, because the tutor-student match process is not bound by location. At Applerouth, we use the Zoom platform for real-time audio and video. Zoom furnishes your student with advanced collaboration tools, including an interactive whiteboard and collaborative document sharing. Click here to test your internet connection by joining a test meeting. Applerouth online students receive the same Higher Score Guarantee as in-person clients. We believe in our tutors' abilities so much that we guarantee a higher score or we will work with you to help you hit your increase. With our Higher Score Guarantee, students who do not achieve an increase will receive complimentary tutoring in preparation for the next official test.